In English the expression "walking on eggshells" is used to describe a situation, person or issue that requires tremendous sensitivity, care and attention as it may be volatile, explosive, fragile, and potentially psychologically, emotionally or physically dangerous. 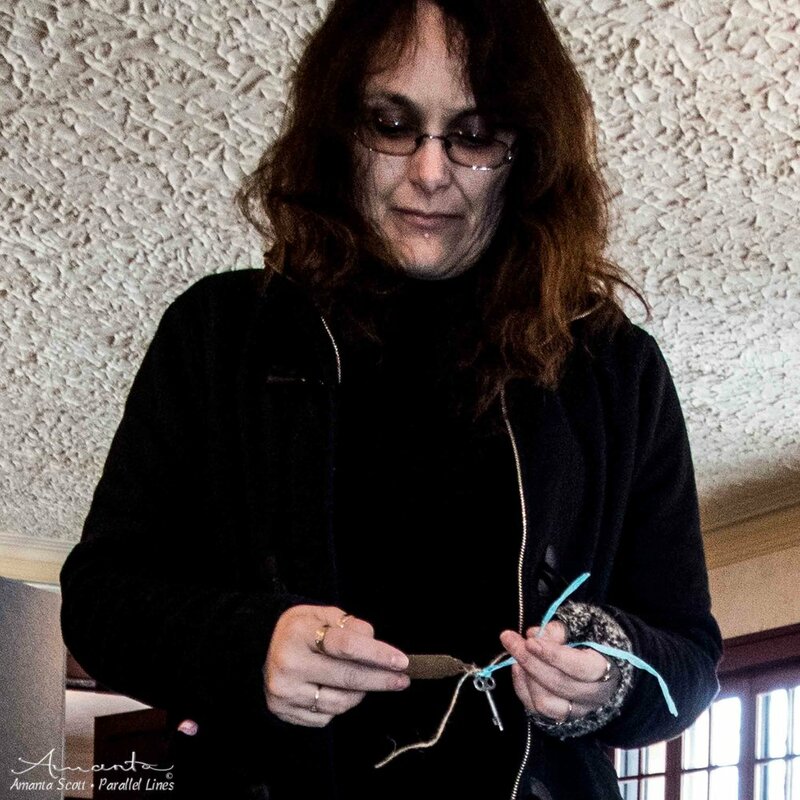 Opening a discussion on a contentious topic; coming out; sharing who you are and/or what has happened to you; daring to be different; speaking up and asking for what you need; walking your own path — all this can feel like walking on eggshells. 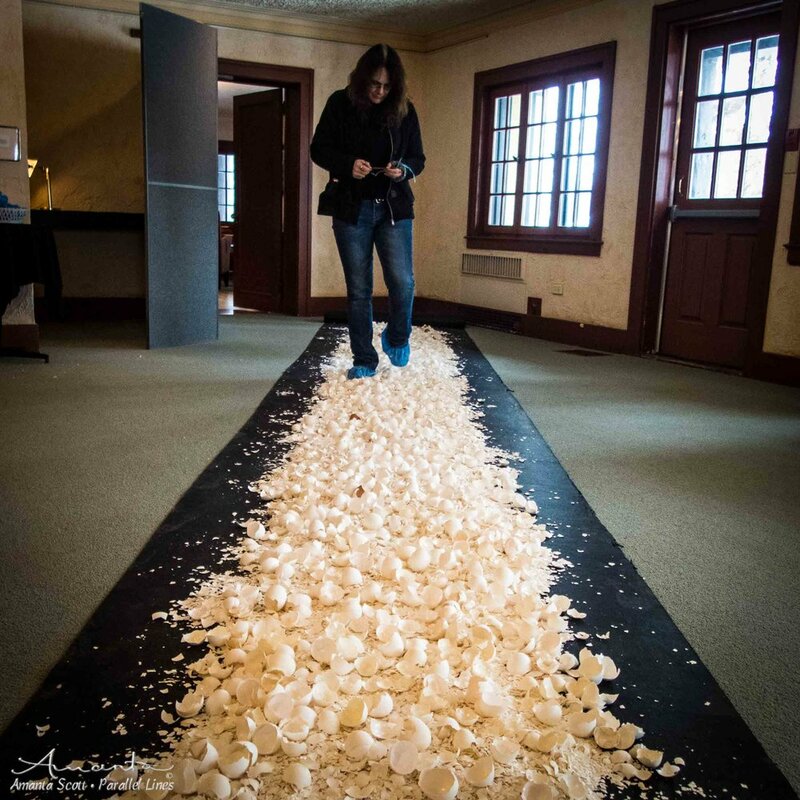 This interactive installation features a pathway of eggshells upon which Visitors may walk, accompanied or alone: each silently acknowledging their own private histories; the fragile nature of memory and emotion; and the uneasy path we all must navigate in order to escape our prisons and find healing. Interestingly, although this expression is in common usage, very few people have actually walked on eggshells. When invited to do so — at Museum of Northern History, Kirkland Lake — many participants were extremely anxious. Their relief, upon completion of the path, was palpable. 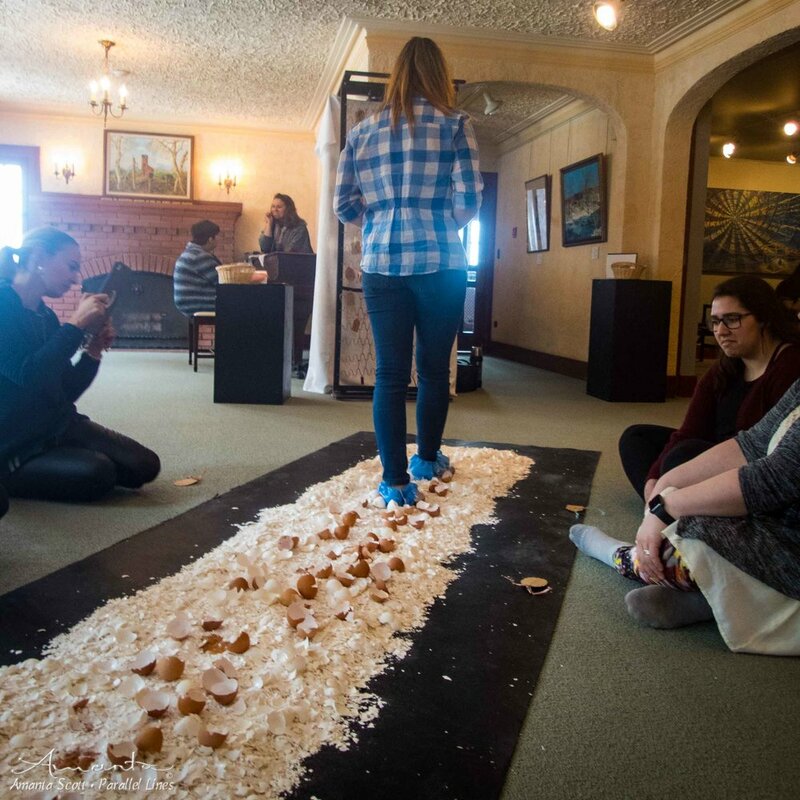 The 35+ ft black rubber underlay beneath the path of eggshells was generously provided by National Rubber Technologies, a KN Rubber company — North America's leading supplier of engineered products and materials derived from recycled rubber. Visitors are also invited to walk the pathway holding a key bearing a tag upon which is written one word indicating something they are seeking in life. Many find that walking the path while meditating on what they seek in life turns the activity into an almost ritualistic healing experience. When they reach the end of the path they may then tie the key and tag to the prison bed in the installation — Esperanza. Alternatively, Visitors may also write a memory or message on vellum, crumple the vellum and add it to the path of eggshells. Esperanza features a prison bed (suspended from the ceiling on the diagonal or standing on end if so required) adorned with keys donated by Visitors. Accompanying each key is a manila tag identifying in one word, what this key may open or enable. Visitors are invited to tie a spare key to the bed with a manilla tag upon which they have written one word in various languages indicating what it is they seek in life to release them from their personal prisons. This word may be repeated on the alternate side of the tag or written in another language. forgiveness . . . healing . . . freedom . . . acceptance . . . love . . . success . . . health . . . friendship . . . support . . . myself . . . solitude . . . peace . . . family . . . Visitors are invited to meditate upon what they seek and then walk the path of eggshells — Fragile — before or after tying the key to the bed.